Because Veterans Day falls on a Sunday this year, the federal holiday is this coming Monday, November 12th. On that day, the following facilities are closed in Southborough: public schools, Town offices, the Southborough Library, and the Senior Center. As for our Town’s observance of the holiday, it always takes place on the actual day of remembrance, Sunday, “The 11th hour of the 11th day of the 11th month”. The ceremony is preceded by a short parade led by American Legion 161 and Veterans of Foreign Wars – Post 3276. The parade is comprised of veterans, town Scout groups, Algonquin students, and representatives from the State House and Board of Selectmen. 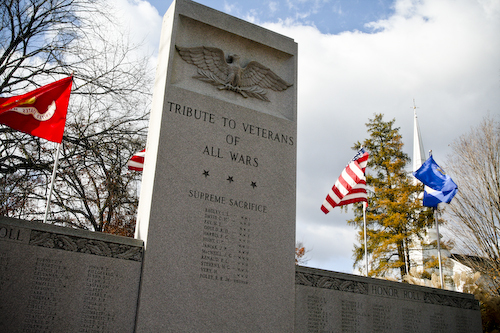 Following tradition, the Veterans Day ceremony is held at the All Wars Memorial on the Common. The 30-40 minute ceremony remembers our fallen and honors those who serve today and all those who have served our nation. It includes readings and patriotic music. VFW Post 3276 and American Legion Post 161 – extend our invitation to residents to join us Sunday – November 11th at 1100 at our Veterans Day Observance. Veterans will meet at the Post HQ at the Community House at 1015 and march to the All Wars Memorial at 1045 – Our observance begins at 1100. This year we honor the 100th Anniversary of the end of WWI and the 50th Anniversary of the only Southborough service member lost in Vietnam – Robert R. Foley. We will also unveil the names of the 83 residents from Southborough who have served during the Global War on Terrorism. The public is invited to join with us as we remember.